‘Write what you know’ is one of those precepts given in English classes. My eclectic reading habits of the past six months have certainly been taking me through a series of books by authors who have done just that. One of my favorites is an autobiography written by Ernest Wilkinson. Ernie has lived and worked (in partnership with his wife Margaret) in the Monte Vista, Colorado area since his birth in 1924. 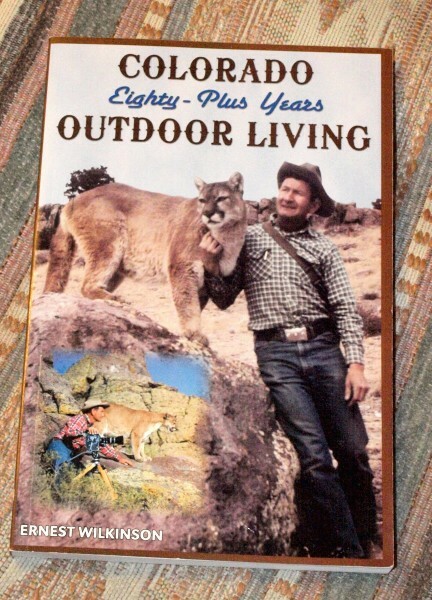 His book Colorado Outdoor Living, Eighty-Plus Years gives insights into his growing up on a horse-powered (literally) family farm, his years as a government hunter trapping bear and coyote in the Rio Grande headwaters, as an animal consultant for early Disney wildlife films, pioneering area conservationist and as a guide and instructor to folks wanting to get into the wilderness. The Wilkinsons have taught thousands over the years (including university groups) through primitive-skills workshops, free lectures, and backcountry backpacking trips. Ernie is still in great demand as a taxidermist with a backlog of orders each season. Whenever I’m in the area, I’m sure to pick up a newspaper and read Ernie’s weekly outdoor column which has been running since 1968. His book on snow-caving is a local Colorado classic with more practical information about winter travel and overnighting than anything else I’ve seen. I’ve been privileged to meet Ernie a couple of times. The first time a friend and I were fishing a small stream about two miles inside the wilderness boundary from the trailhead when we rounded a corner and spotted two seriously older gents working slowly along the bank. We stopped to chat and learned that there was a third in their party who we’d seen downstream. He was ‘the young guy’ only in his mid-60’s and his task apparently was to help the two others up when they fell. Ernie was about 83 at the time and recuperating from a car accident that left him with a number of broken bones. His major complaint was that he’d missed most of the summer fishing season. I’m grateful for folks like Ernie both for writing so simply and yet so knowingly about his terrain, his plants, his animals–he writes what he knows. And I’m grateful for the example of someone who stays connected to that. Wilkinson,Ernest. Colorado Outdoor Living, Eighty-Plus Years. Monte Vista, Colorado: Adobe Village Press, 2008. This entry was posted in Nature&history and tagged Colorado, conservation, mountains, wildlife. Bookmark the permalink.